Diagram of an air conditioner. The term air conditioning most commonly refers to the cooling and dehumidification of indoor air for thermal comfort. In a broader sense, the term can refer to any form of cooling, heating, ventilation, or disinfection that modifies the condition of air. 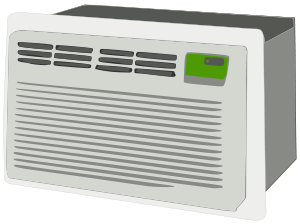 An air conditioner (AC or A/C in North American English, aircon in British and Australian English) is an appliance, system, or mechanism designed to stabilize the air temperature and humidity within an area (used for cooling as well as heating, depending on the air properties at a given time). It typically involves a refrigeration cycle but sometimes utilizes evaporation, most commonly for comfort cooling in buildings and transportation vehicles. If an air-conditioning system is poorly maintained, it can promote the growth of pathogenic microbes. On the other hand, a well-designed and well-maintained system can provide a clean, safe, hypoallergenic atmosphere, which is necessary in places such as hospital operating rooms. In cases of serious heat waves, air conditioning can save the lives of the elderly. Although the moving of heat with machinery to provide air conditioning is a relatively modern invention, the cooling of buildings is not. The ancient Romans were known to circulate aqueduct water through the walls of certain houses to cool them. As this sort of water usage was expensive, generally only the wealthy could afford such a luxury. Medieval Persia had buildings that used cisterns and wind towers to cool buildings during the hot season: cisterns (large open pools in a central courtyards, not underground tanks) collected rain water; wind towers had windows that could catch wind and internal vanes to direct the airflow down into the building, usually over the cistern and out through a downwind cooling tower. Cistern water evaporated, cooling the air in the building. In 1820, British scientist and inventor Michael Faraday discovered that compressing and liquefying ammonia could chill air when the liquefied ammonia was allowed to evaporate. In 1842, Florida physician John Gorrie used compressor technology to create ice, which he used to cool air for his patients in his hospital in Apalachicola, Florida. He hoped eventually to use his ice-making machine to regulate the temperature of buildings. He even envisioned centralized air conditioning that could cool entire cities. Though his prototype leaked and performed irregularly, Gorrie was granted a patent in 1851 for his ice-making machine. His hopes for its success vanished soon afterwards when his chief financial backer died; Gorrie did not get the money he needed to develop the machine. According to his biographer Vivian M. Sherlock, he blamed the "Ice King," Frederic Tudor, for his failure, suspecting that Tudor had launched a smear campaign against his invention. Dr. Gorrie died impoverished in 1855 and the idea of air conditioning faded away for 50 years. Early commercial applications of air conditioning were manufactured to cool air for industrial processing rather than personal comfort. In 1902 the first modern electrical air conditioning was invented by Willis Haviland Carrier. Designed to improve manufacturing process control in a printing plant, his invention controlled not only temperature but also humidity. The low heat and humidity were to help maintain consistent paper dimensions and ink alignment. Later Carrier's technology was applied to increase productivity in the workplace, and The Carrier Air Conditioning Company of America was formed to meet rising demand. Over time air conditioning came to be used to improve comfort in homes and automobiles. Residential sales expanded dramatically in the 1950s. In 1906, Stuart W. Cramer of Charlotte, North Carolina, USA, was exploring ways to add moisture to the air in his textile mill. Cramer coined the term "air conditioning," using it in a patent claim he filed that year as an analogue to "water conditioning," then a well-known process for making textiles easier to process. He combined moisture with ventilation to "condition" and change the air in the factories, controlling the humidity so necessary in textile plants. Willis Carrier adopted the term and incorporated it into the name of his company. This evaporation of water in air, to provide a cooling effect, is now known as evaporative cooling. The first air conditioners and refrigerators employed toxic or flammable gases like ammonia, methyl chloride, and propane which could result in fatal accidents when they leaked. Thomas Midgley, Jr. created the first chlorofluorocarbon gas, Freon, in 1928. The refrigerant was much safer for humans but was later found to be harmful to the atmosphere's ozone layer. Freon is a trademark name of DuPont for any Chlorofluorocarbon (CFC), Hydrogenated CFC (HCFC), or Hydrofluorocarbon (HFC) refrigerant, the name of each including a number indicating molecular composition (R-11, R-12, R-22, R-134). The blend most used in direct-expansion comfort cooling is an HCFC known as R-22. It is to be phased out for use in new equipment by 2010 and completely discontinued by 2020. R-11 and R-12 are no longer manufactured in the US, the only source for purchase being the cleaned and purified gas recovered from other air conditioner systems. Several non-ozone depleting refrigerants have been developed as alternatives, including R-410A, known by the brand name Puron. Innovation in air conditioning technologies continue, with much recent emphasis placed on energy efficiency and improving indoor air quality. As an alternative to conventional refrigerants, natural alternatives like CO2 (R-744) have been proposed. Air conditioning engineers broadly divide air conditioning applications into comfort and process. Comfort applications aim to provide a building indoor environment that remains relatively constant in a range preferred by humans despite changes in external weather conditions or in internal heat loads. The highest performance for tasks performed by people seated in an office is expected to occur at 72 °F (22 °C) Performance is expected to degrade about one percent for every two °F change in room temperature. The highest performance for tasks performed while standing is expected to occur at slightly lower temperatures. The highest performance for tasks performed by larger people is expected to occur at slightly lower temperatures. The highest performance for tasks performed by smaller people is expected to occur at slightly higher temperatures. Although generally accepted, some dispute that thermal comfort enhances worker productivity, as is described in the Hawthorne effect. Institutional buildings, which includes hospitals, governmental, academic, and so on. Industrial spaces where thermal comfort of workers is desired. In addition to buildings, air conditioning can be used for comfort in a wide variety of transportation including land vehicles, trains, ships, aircraft, and spacecraft. Hospital operating theatres, in which air is filtered to high levels to reduce infection risk and the humidity controlled to limit patient dehydration. Although temperatures are often in the comfort range, some specialist procedures such as open heart surgery require low temperatures (about 18 °C, 64 °F) and others such as neonatal relatively high temperatures (about 28 °C, 82 °F). Facilities for breeding laboratory animals. Since many animals normally only reproduce in spring, holding them in rooms at which conditions mirror spring all year can cause them to reproduce year round. Aircraft air conditioning. Although nominally aimed at providing comfort for passengers and cooling of equipment, aircraft air conditioning presents a special process because of the low air pressure outside the aircraft. In both comfort and process applications the objective may be to not only control temperature, but also humidity, air quality, air motion, and air movement from space to space. Refrigeration air conditioning equipment usually reduces the humidity of the air processed by the system. The relatively cold (below the dewpoint) evaporator coil condenses water vapor from the processed air, (much like an ice cold drink will condense water on the outside of a glass), sending the water to a drain and removing water vapor from the cooled space and lowering the relative humidity. Since humans perspire to provide natural cooling by the evaporation of perspiration from the skin, drier air (up to a point) improves the comfort provided. The comfort air conditioner is designed to create a 40 to 60 percent relative humidity in the occupied space. In food retailing establishments large open chiller cabinets act as highly effective air dehumidifying units. Some air conditioning units dry the air without cooling it, and are better classified as dehumidifiers. They work like a normal air conditioner, except that a heat exchanger is placed between the intake and exhaust. In combination with convection fans they achieve a similar level of comfort as an air cooler in humid tropical climates, but only consume about a third of the electricity. They are also preferred by those who find the draft created by air coolers discomforting. A poorly maintained air-conditioning system can occasionally promote the growth and spread of microorganisms, such as Legionella pneumophila, the infectious agent responsible for Legionnaires' disease, or thermophilic actinomycetes. Conversely, air conditioning, including filtration, humidification, cooling, disinfection, and so forth, can be used to provide a clean, safe, hypoallergenic atmosphere in hospital operating rooms and other environments where an appropriate atmosphere is critical to patient safety and well-being. Air conditioning can have a positive effect on sufferers of allergies and asthma. In serious heat waves, air conditioning can save the lives of the elderly. Some local authorities even set up public cooling centers for the benefit of those without air conditioning at home. Poorly operating air conditioning systems can generate sound levels that contribute to hearing loss, if exposures are endured over a long term. These levels are similar to the exposure of living near a busy highway or airport for a considerable length of time. Properly functioning air conditioners are much quieter. It should be noted that in a thermodynamically closed system, any energy input into the system that is being maintained at a set temperature (which is a standard mode of operation for modern air conditioners) requires that the energy removal rate from the air conditioner increase. This increase has the effect that for each unit of energy input into the system (say to power a light bulb in the closed system) requires the air conditioner to remove that energy. In order to do that the air conditioner must increase its consumption by the inverse of its efficiency times the input unit of energy. As an example presume that inside the closed system a 100 watt light bulb is activated, and the air conditioner has an efficiency of 200 percent. The air conditioner's energy consumption will increase by 50 watts to compensate for this, thus making the 100 W light bulb utilise a total of 150 W of energy. A split system has an indoor unit on wheels connected to an outdoor unit via flexible pipes, similar to a permanently fixed installed unit. Hose systems Air-to-Air and Monoblock are vented to the outside via air ducts. A function of all cooling that use a compressor, is to create water as it cools the air. The "monoblock" version collects the water in a bucket or tray and stops when full. The Air-to-Air version, re-evaporates the water and discharges it through the ducted hose and can hence run continuously. A single duct unit draws air out of the room to cool its condenser. This air is then replaced by hot air from outside or other rooms, thus reducing efficiency. However, modern units run on approximately one to three ratio, that is, to produce three kW of cooling the unit will use one kW of electricity. Air cooled portable air conditioners are compressor-based refrigerant system that uses air to exchange heat, similar to a car or typical household air conditioner. With this type of system the air is dehumidified as it is cooled. Evaporative air conditioners do not have a compressor or condenser. Instead, liquid water is poured in and released as vapor. Because they do not have a condenser that needs cooling, they do not need hoses or pipes, allowing them to be truly portable. As a rule of thumb, 400 square feet (37 m²) can be cooled per 12,000 BTU/h (3.5 kW or one ton of air conditioning) by a refrigerative air conditioner. However, other factors will affect the total heat load. Evaporative air conditioners use much less energy. ↑ ASHRAE Terminology of HVAC&R, ASHRAE, Inc., Atlanta, 1991. ↑ Ancient air conditioning - Retrieved December 11, 2007. ↑ History of Air Conditioning - Retrieved December 11, 2007. ↑ The History of Air Conditioning - Retrieved December 11, 2007. ↑ The current status in Air Conditioning - papers & presentations - Retrieved December 11, 2007. ↑ Evaluation Of Cost Effectiveness Of Indoor Climate - Retrieved December 11, 2007. ↑ Sick building syndrome - Retrieved December 11, 2007. ↑ Home Control of Asthma & Allergies - Retrieved December 11, 2007. This page was last modified on 13 February 2019, at 00:15.